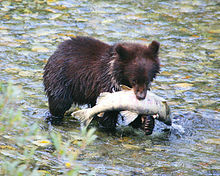 In the Pacific Northwest and Alaska, salmon are keystone species, supporting wildlife from birds to bears and otters. The bodies of salmon represent a transfer of nutrients from the ocean, rich in nitrogen, sulfur, carbon and phosphorus, to the forest ecosystem. Grizzly bears function as ecosystem engineers, capturing salmon and carrying them into adjacent wooded areas. There they deposit nutrient rich urine and faeces and partially eaten carcasses. Bears are estimated to leave up to half the salmon they harvest on the forest floor, in densities that can reach 4,000 kilograms per hectare, providing as much as 24% of the total nitrogen available to the riparian woodlands. The foliage of spruce trees up to 500 m (1,600 ft) from a stream where grizzlies fish salmon have been found to contain nitrogen originating from fished salmon. Slow the rate at which nutrients are flushed from the system; nutrients provided by adult salmon dying throughout the fall and winter remain available in the spring to newly-hatched juveniles. Provide deeper water pools where young salmon can avoid avian predators. Increase productivity through photosynthesis and by enhancing the conversion efficiency of the cellulose-powered detritus cycle. Create low energy environments where juvenile salmon put the food they ingest into growth rather than into fighting currents. Increase structural complexity with many physical niches where salmon can avoid predators. Beavers' dams are able to nurture salmon juveniles in estuarine tidal marshes where the salinity is less than 10 ppm. Beavers build small dams of generally less than 2 feet (60 cm) high in channels in the myrtle zone. These dams can be over topped at high tide and hold water at low tide. This provides refuges for juvenile salmon so they do not have to swim into large channels where they are subject to predation. Tasty and healthy dinner under 30 minutes. What is your favorite fish? Leave me a comment. Preheat oven to 350 degrees. Spray baking dish with non stick cooking spray. Season salmon with salt and pepper. Drizzle melted butter over salmon. Place french fried onions and parsley in a resealable bag. Crush french fried onions until they are in crumbs. Divide onion mixture on each salmon fillet. Bake 18 to 20 minutes, until fish flakes easily with a fork. What an amazingly beautiful recipe!!! Thank you!! I must try the onion crust! That looks delicious! I love this simple recipe yet delicious soundings dish! I am a salmon lover, eat it at least twice a week so I so excited to try this! 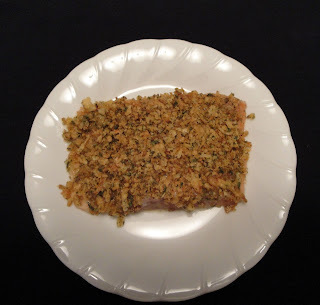 Looks easy and really tasty--always looking for new things to do with salmon, which I love. I love salmon. Can't wait for my husband to go fishing in BC this summer. Looking forward to the catch they bring home. Thanks for sharing the recipe. i can't wait to make it. Yum! Anything with onion is delicious. I'd love to give this a try some night for dinner. Thank you for sharing.